Greetings, fellow fan card enthusiasts! Roots and Renewal has been in development for over three years now, and little remains of my first card creations today. I’m constantly coming up with fresh ideas that fit the set’s core concepts. This is why it’s still far from finished and any feedback and practical experiences are greatly appreciated. 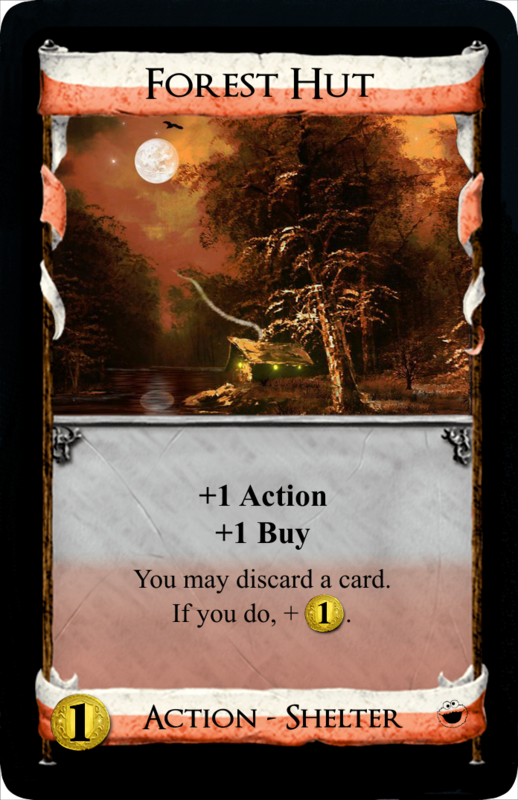 This thread is being updated regularly, with frequent adjustments to cards, so check back from time to time so you don’t miss anything! A huge thanks goes to Asper for countless fun and interesting test games and plenty of feedback. Also thanks to Fragasnap and LastFootnote for their help and everybody else who keeps coming back and leaves a comment every now and then. 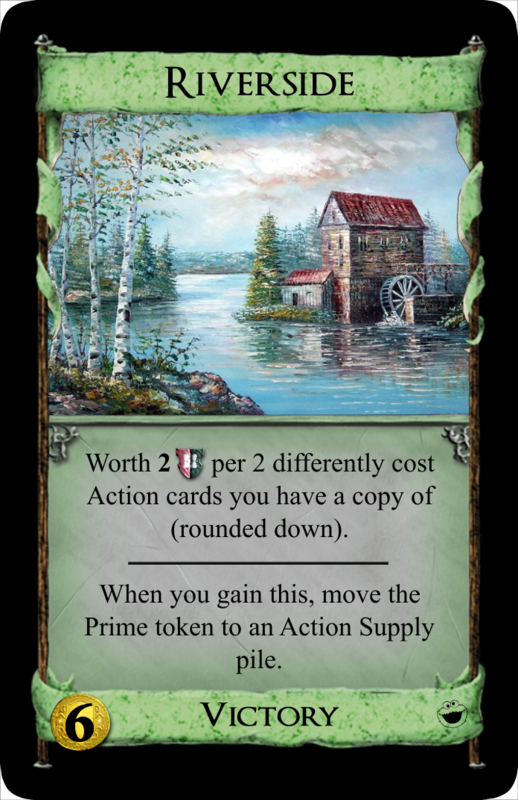 The Prime token increases the cost of all cards from the pile it's placed on by $1 and annuls all previous, current and future cost reductions of those cards. 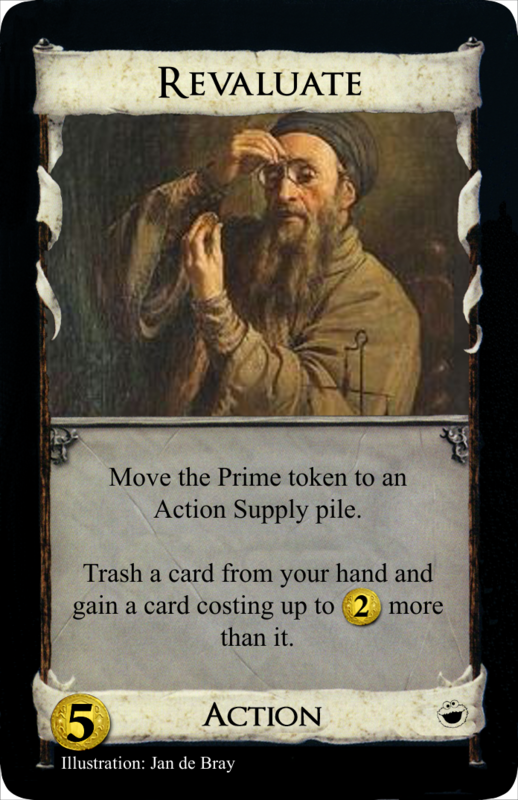 As soon as the Prime token is removed from that pile, this effect is made void retroactively, meaning that all past and current cost reductions now apply to cards from that pile even if they are result of resolving cards that have been played when the Prime token was still there. 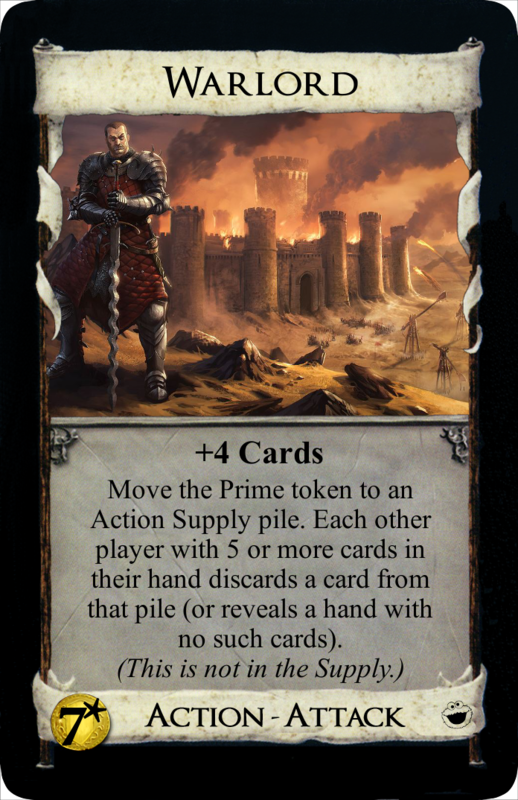 There is only one Prime token, shared by all players. 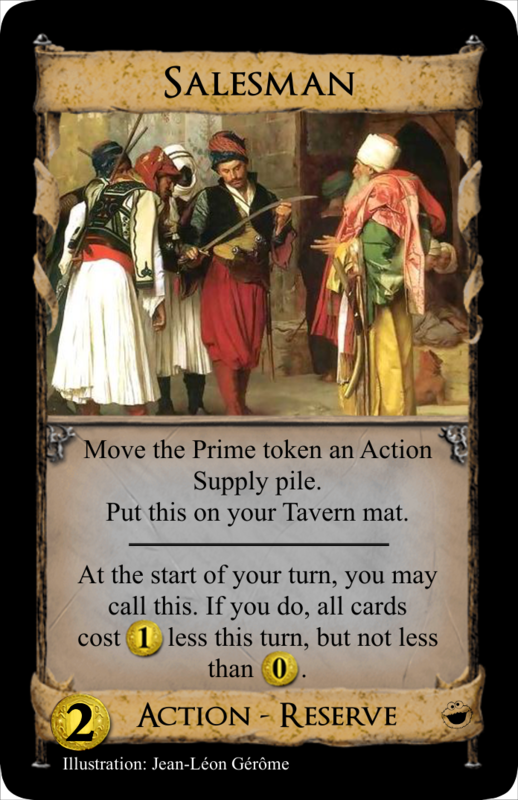 When a player is by a card, event or landmark instructed to move the Prime token he may choose to move it to the pile it’s currently on (hence leaving it there). 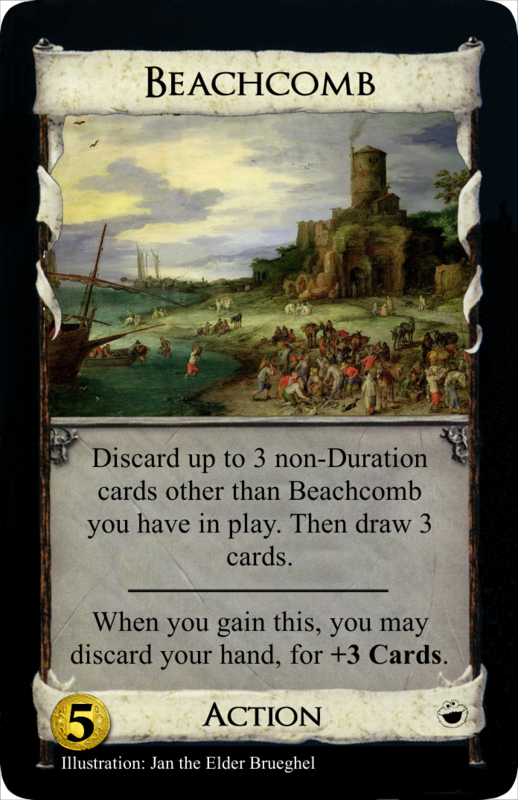 Re: Card ideas for set themes "return to supply" and "care about discard pile"
Fraud - The reaction is political in 3+ player games (do I discard it now to hurt this player, or hang onto it and hope to hurt the next player?). I do think it's kind of a cool reaction though. In fact, I think if you just have it reveal itself instead of discarding, then it's non-political. Actually, then it has another problem though; if two players disagree on what card they want another player to gain, I think they can go on indefinitely revealing their Frauds? So I'm not sure there's a clean fix. Cavalry - Aside from being insanely strong (even without the attack part, I think it would be a very strong $5), the discard attack is too brutal. In general in Dominion, nothing can ever force a player to play on a two-card hand. 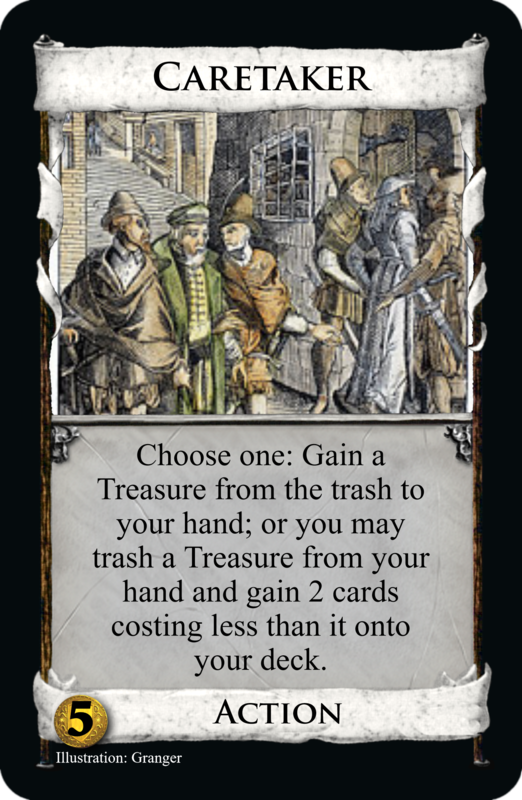 Torturer gives other players the option to discard past three cards, but they can always just choose to gain a Curse, so it's fine. Cutpurse can if you manage to stack them and the opponent has mostly Copper, but by the time you can stack Cutpurses usually your opponent has enough non-Copper cards in his deck that a pin is not possible. A bunch of Rabbles chained together can effectively gives someone a 2-card hand, but 1. that takes a lot of work and is hard to do consistently and 2. by the time such a Rabble chain can be pulled off consistently, the game is likely nearing an end anyway (either the player doing it has a very strong deck, or the player on the receiving end has a lot of green in their deck). OTOH, Cavalry rewards you for trashing three cards (which is already a swingy mechanic) by forcing other players to discard down to two. That pretty much stops them dead, and it does so early in the game (when you're more likely to have three cards you want to trash), so you accelerate way faster than them. Also, I just noticed now that there's actually nothing stopping you from forcing other players to discard their entire hand with multiple Cavalries, or with Militia followed by Cavalry, etc. So that's a huge problem. I don't find the card particularly appealing anyway, but you could easily just cut out the whole attack part and it would still be a very strong $5 I would think. In fact even just +3 cards, trash up to 3 from hand I think would be a very strong $5, and Cavalry (without the attack) is strictly better than that. Juggler - I think "+2 Cards, +$2" is generally considered to be a strong $5, and it looks like Juggler is strictly better than that? So it probably needs a nerf (maybe just make the bonus +$1 or something like that). As for the main themes, "interacting with the discard pile" might be fine. But the "returning cards to the supply" thing I think is not a good theme. Ambassador is the only official card that can return cards to the supply, and I think that's kind of its special thing. 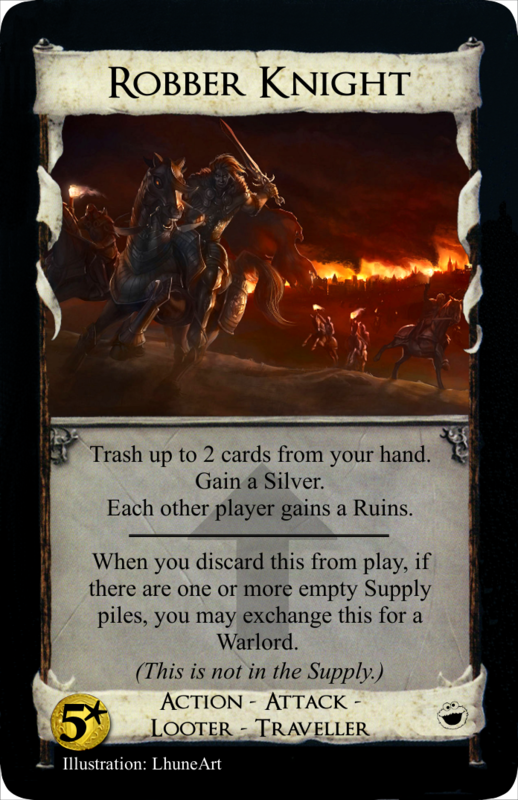 Returning to the supply is generally very similar to trashing; the fact that the supply piles are replenishing a little and that on-trash effects are not triggered (and returned cards can't be dug up by Rogue/Graverobber) are all just minor functions in comparison to the overall purpose of the card. But another important thing about returning to the supply is that it creates the potential for very long, and possibly even unending, games. 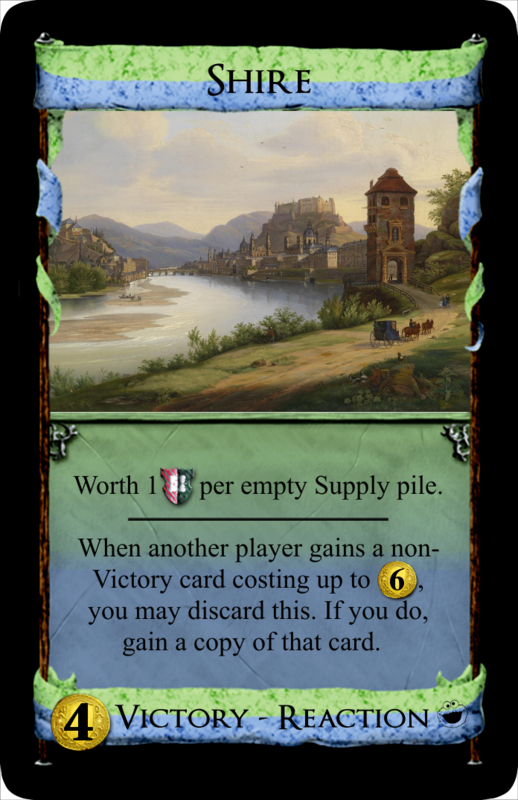 Ambassador tries to solve this problem by making it (usually) only possible to actually increase the size of a supply pile in 2-player games when two cards are returned. Usually, this only means that the Copper and Estate piles will ever get bigger, which is fine. 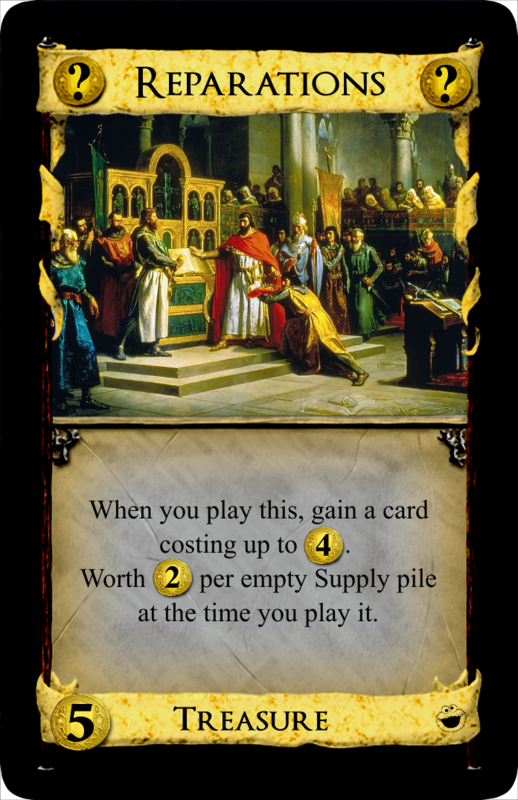 But for example with Reconvert, you might want to return expensive cards, which means other supply piles might increase in size. 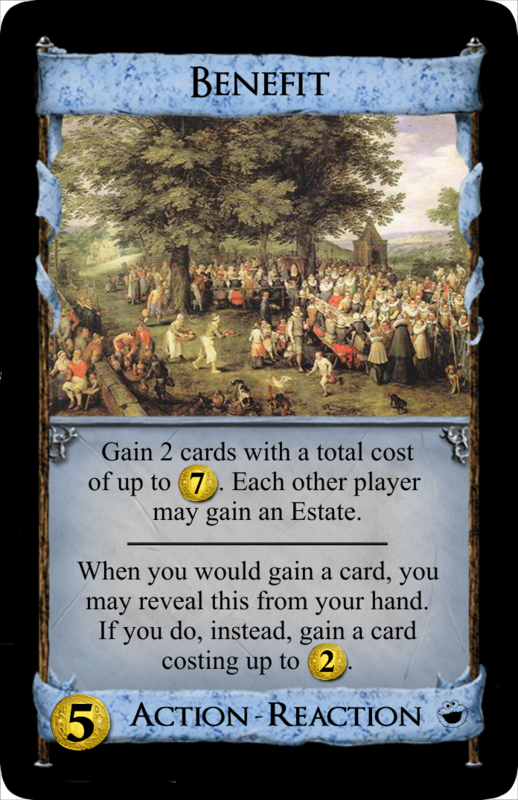 In that case I guess it's fine since Reconvert will usually force you to gain at least one other card, but it's something to watch out for. It's not strictly better. 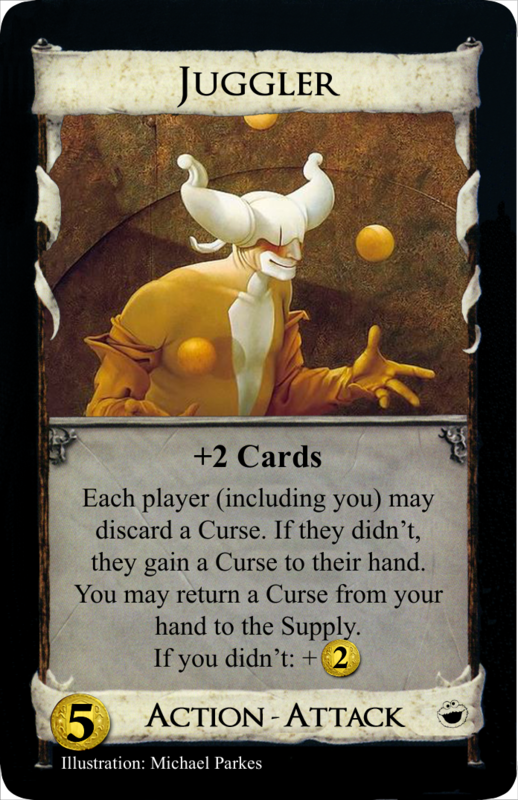 You gain the Curse first, so the attack is worse for you than for your opponents on average (though, you get to draw cards first, increasing the likelihood of having a Curse in your hand). It's also possible that your opponents' strategies benefit more from "everyone gaining a Curse" than yours, or that they have the Curse to discard and you don't. I need to think about that. 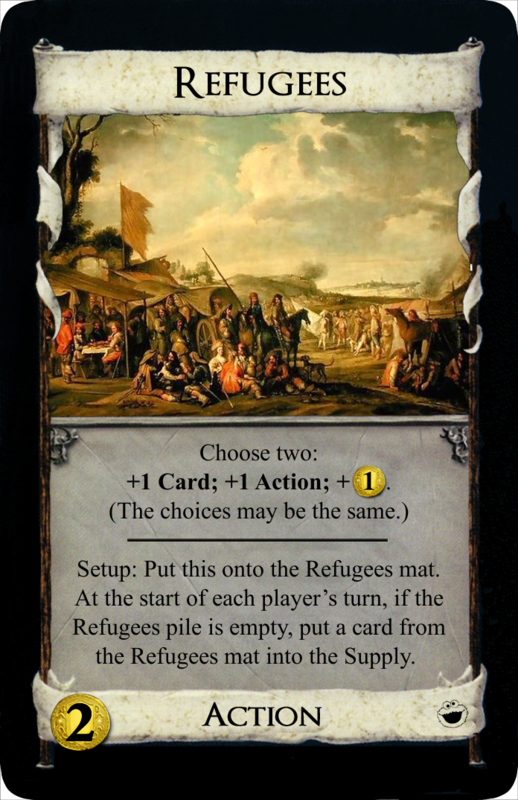 I would really like a card that can change what another player is gaining, but how to solve the political issue? I will try to think of an alternative way, because it should not stand as it is. Okay yeah, it's too strong. But let's say I want to keep the attack. So I would either cut the +3 cards or, which might be more reasonable, cut the trashing. Mercenary rewards trashing with a discard attack and other bonuses, which is very strong. So maybe Cavalry should make your opponent discard (down to 3) when you place 2 cards on top of your deck? Would that seem fairer? I must admit, I did not think about what I want to achieve with returning things to the supply instead of trashing them, yet. There could be cards that care about piles or pile sizes... this part needs a lot more consideration. Until then, this particular theme may not seem so viable . Oh right, I was thinking you could return the curse and get +$2, but that's not possible. It might be okay then. Bivouac's reaction is a bit strange. So the way I read it, you don't have the option to just reveal it, like you do with Horse Traders or Watchtower, right? Rather it needs to get revealed by something else. 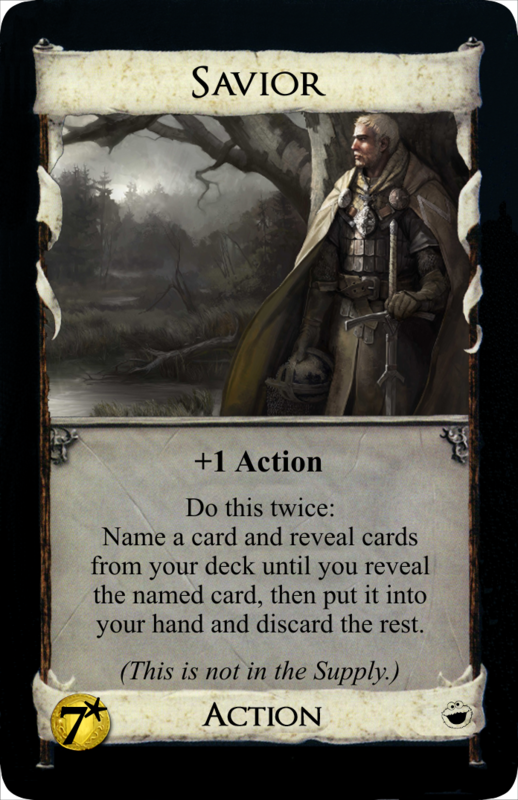 But the rules don't specifically define when such a thing would trigger... do you intend for it to trigger anytime an effect says "reveal", and it is one of the cards that is shown to your opponent's this way? Or do you intend for it to trigger anytime the card becomes visible to your opponent? You play Sage. As you are revealing cards, you reveal Bivouac. I'm sure the card allows you to react in this case. Opponent plays Cutpurse. You have no Copper, so you reveal your hand. Bivouac is in your hand. I assume you can use the reaction now, but not 100% sure. You play Library. As you are drawing cards, you set aside a Bivouac. Can you react now? Nothing said "reveal", but the card was indeed revealed in that your opponent's can now see it. During cleanup you discard your hand, and your hand included a Bivouac. You put Bivouac on top of the discard pile, so it in now revealed to your opponent. Can you react? (If so, that's a pretty strong ability). You play Bivouac. When you need to discard a card to it, you discard another Bivouac. That second Bivouac is now revealed, so can you react? 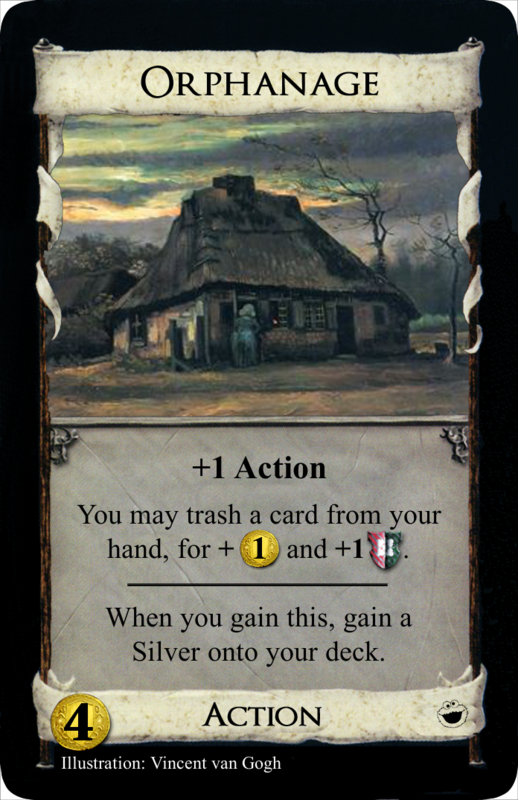 (If so, this card is VERY strong, since having another one in hand makes the first one as good as regular village). 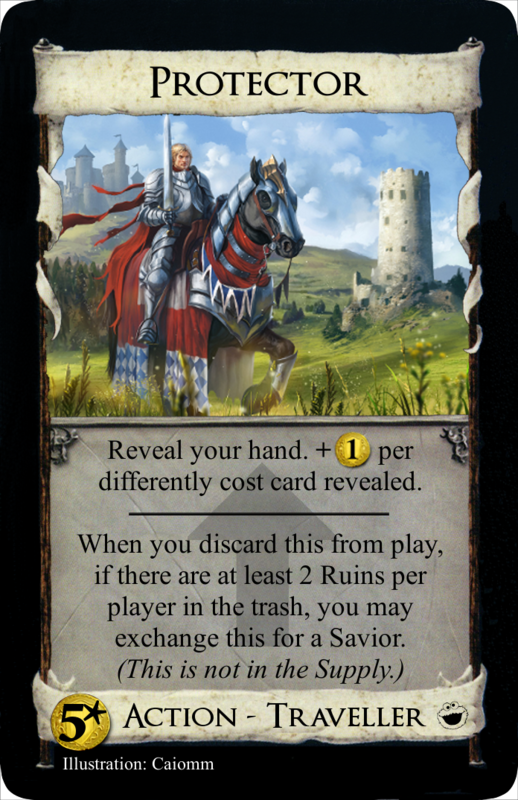 Basically, "when this is revealed" isn't a clearly defined event in Dominion. Suburbia... the way it is worded now, you can trash 1 card, then reveal Suburbia from your hand 30 times to draw 30 cards. You are always allowed to reveal the same reaction card multiple times to the same event. Cards like Horse Traders prevent this by having you set it aside, so you would need to do something like that. Town Portal A looks extremely weak. 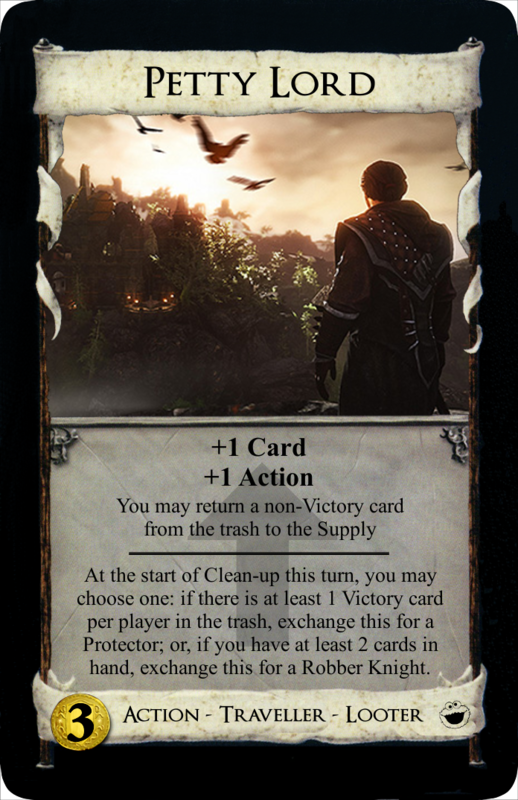 Without having other Action-Victory cards, or Vault/Cellar/Warehouse/Secret Chamber/Crossroads around, then the action seems to be 99% worthless, so it may as well just be 2VP for $4 (which you would still buy sometimes, but just as a regular VP card). Town Portal B seems very strong. WAY better than Great Hall at $4 instead of $3. 2 VP instead of 1, and the action is quite strong if you have several Town Portals in your deck. Basically, as long as you have at least 1 in your discard pile, playing 1 is as good as a Laboratory. I agree with scott_pilgrim on Fraud. The reaction is a really neat attack. Less swingy than Swindler. It might even be too strong, possibly a $5. But I'd start testing with $4 like you have it. But he's also right that there's issues... what if 2 people react to the same gain? I have no idea how to fix it for a 3 or 4 player game, but I hope you find a way, because I like it. Reconvert... seems ok but weak. Maybe $3 instead? Unless it turns out that it's actually stronger at $4, because you can Reconvert a Reconvert into a $5. Slurry Pit... I think another Masquerade-thing is a good idea. But note that the rare case of playing Masq when you or an opponent has 0 cards to pass will be a little more common here... as long as their discard pile is empty, they can't pass a card. And if you play it with an empty discard pile, you steal a card from them without giving anything back. It can't pin like Masq can, but it can still "trash" all the cards in their discard pile. The cards I didn't specifically mention, I like just fine. As a whole I agree with Scott that the returning to the supply is just a worse version of trashing (not worse as in weaker, but worse as in less good or fun for the game). I think it's fine if they just trashed instead. But I think there's some really good ideas in here! The reaction is meant to trigger only when another card makes you explicitly "reveal" it. I'm trying to think of a wording that would make that very clear. 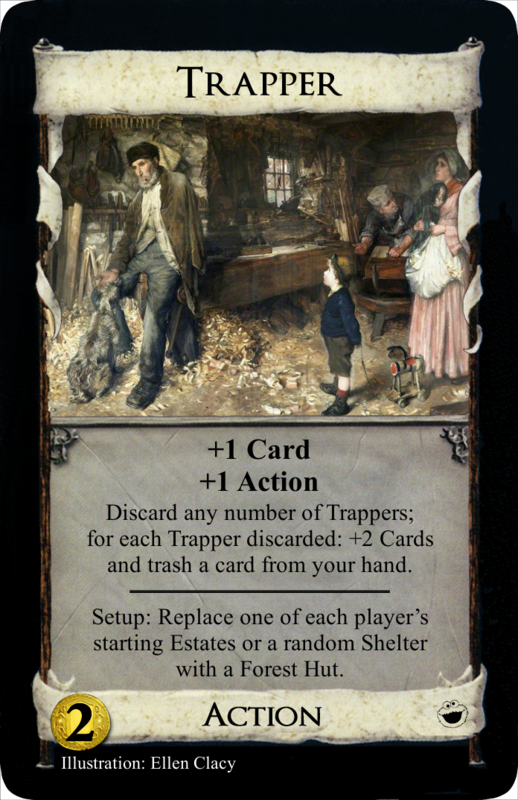 Maybe I will just phrase it like "When another card makes you "reveal" this Bivouac,..." - the quote signs are uncomely, but it should be clear this way. You can trigger the reaction in both cases. As playing the card as an action does not trigger the effect, so does not discarding the card at any time or setting it aside. I should have thought about that. Like Hinterlands or Dark Ages, this set would need to come with some additional rules clarifications as to when a card is "revealed". You have a good point. Of course you should only be able to reveal the card once per trashing. But how do I phrase that? I do not want the card to be discarded from your hand when you use the reaction. Maybe have it set aside and returned to your hand after the trashing? Or just an Outpost-ish phrase like "You may only reveal this once per card trashed or returned." I like to think of it this way: $4 for 2VP may not be a good ratio but at least the card does something, other than most other VP cards at $4 or $5. Scout does a similarly bad thing that only helps you in rare cases with specific cards in the kingdom. But Town Portal A is at least worth 2 VP. While still pretty weak, I would buy it over Scout any day. Yes, it's one of those cards that you don't want your opponent to get all 8/10/12 copies of, like Minion, Knights, Gardens, Tournament etc.. However, as you wrote, the Lab effect is conditional. 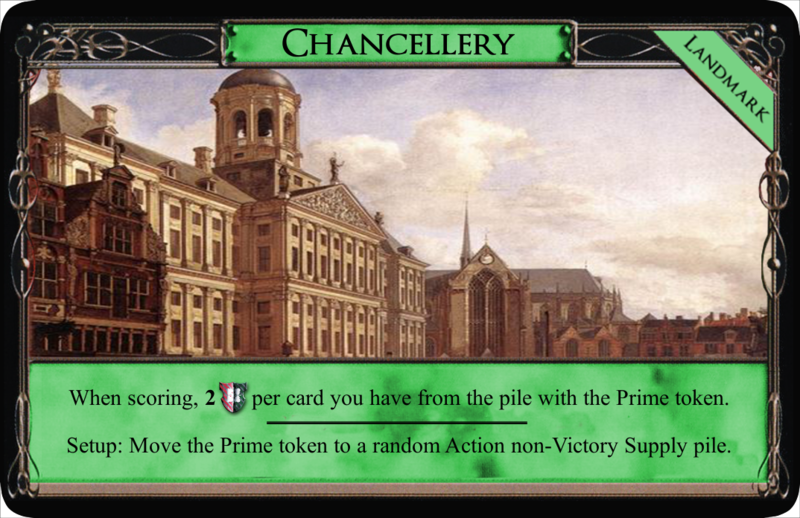 There need to be other City Portals (or Great Halls, Nobles, Harems) in your discard pile, and any time you didn't draw a victory card from your discard pile with it, it's just a cantrip. Also, it's not technically a Lab variant, because you do not cycle 2 cards, but only 1. 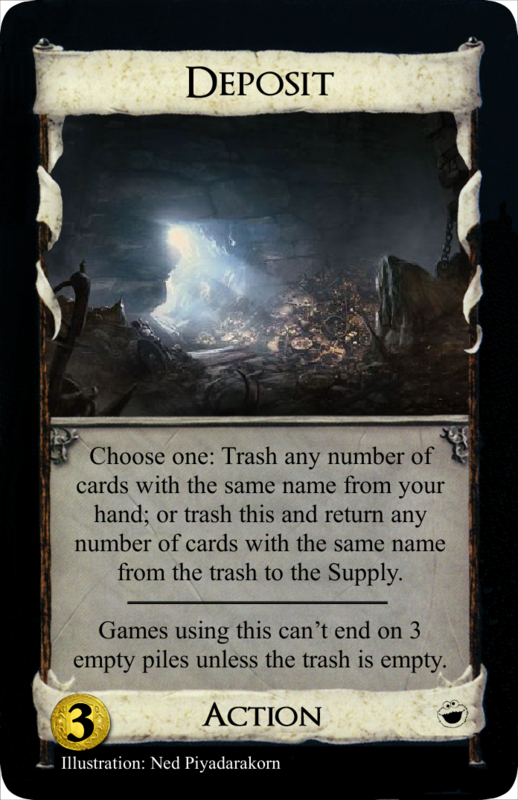 The second card, if there is one, is recycled from the discard. Playtesting will bring more clarity, hopefully. If anything, I might reduce the VP to 1. I think passing all your junk to your opponents is not a big problem with Slurry Pit, because they can easily return the favour the turn after. You have a good point with the "stealing" issue, however. I might add the condition that you need at least 1 card in your discard pile to make the action work. But then I would need to shorten the text in another place so it won't get too wordy. 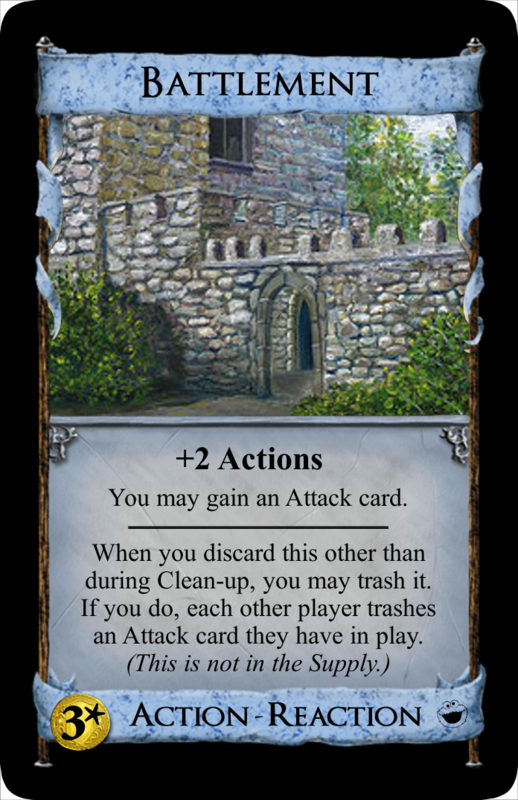 The latter is great to hear I plan to make cards that specifically care about the supply piles that should have some (hopefully fun) interaction with the returning actions. For example an inverted City that gets weaker the more piles are empty. If it turns out, I cannot make any interesting stuff with it, I might change it all to trashing. But for now, it's too early to decide. I have an idea for Fraud. What if you could only use the reaction when the player to your right gains a card? It would still be somewhat political as you might make your decisions depend on what a specific player might do. But it would be a lot less confusing and chaotic. 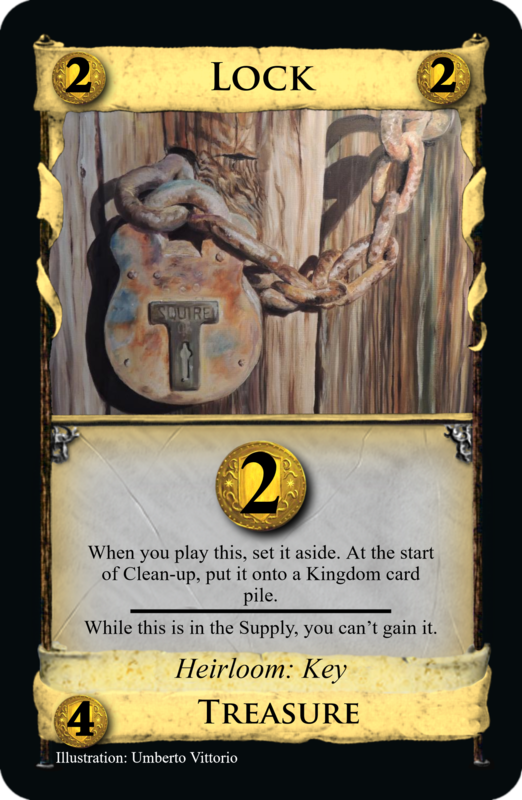 And Contraband shows that this kind of thing is OK in Dominion. The "other than while you play it" wording on the card added extra confusion. If you only intend it to trigger when an effect says "reveal", then there's no need for the "other than while you play it" part. That clause made it sound like you intended it for anytime it became visible to your opponent. Returning to your hand after the trashing won't work; you would still be able to reveal it a second time; reactions are revealed and then resolved 1 at a time. Also, note that if you use an Outpost-type thing to limit it from being used more than once, then even if you have 2 of them in your hand, you wouldn't be able to use each one once. It's not possible for your opponent to know if you have only 1 or 2 of them in your hand. But I don't know any other way to do it. I just think that even without the discard pile part of it, a cantrip 2 VP is already very good for $4. $4 and $3 aren't that different in cost at all, so a $4 shouldn't generally be a much better version of a $3. And when it hits, you do cycle 2 cards, because you play the second City Portal that you got from your discard pile, thus drawing a second card. No, having 2 of them isn't like having 2 labs; but having 1 in your hand and 1 in your discard does draw 2 cards from your deck (or better depending on what else is in your discard) like a lab does. I don't think that's good... in a game where only player A buys Fraud, player C has a big disadvantage over player B, though no choice of his or player B's own. Contraband doesn't hurt just 1 other player; it simply allows 1 other player to choose how to hurt the player who played Contraband. If you can find a way to balance it so that you can keep it in your hand, thus not having to choose which player to hurt with it, that would be good I think. This doesn't fix the issue when the player gaining the card has a Trader in hand. "I gain a Silver." "No, you gain a Smugglers." "No, I gain a Silver." "No, you gain a Smugglers." EDIT: Nevermind. Noticed you have to discard the Fraud. Carry on! I appreciate your consideration but this wouldn't solve the other issue that you addressed: Two or more players could argue infinitely about which card the unfortunate reaction-victim is going to gain. For that reason, Fraud needs to only have one available target player. Right, I'd totally forgotten about that issue! I was only thinking about the issue of being political or targeted. One thing you could do is say "if no one has revealed a Fraud..." This way only 1 person gets to use his Fraud. And the rules already state that if multiple people want to react to the same event, then it goes clockwise from the current player's turn. Of course this would slow things down slightly, as when player A gains a card, player C should wait to see if player B is going to reveal a Fraud before revealing his own. He doesn't want to just reveal it and then give player B the chance to say "wait, I have one too", because that would let player B know that C has a Fraud (plus, B wouldn't want to reveal his Fraud at that point; he'd rather C use his). That's really not the way I want it to go. As you already put out, it makes the reaction very awkward in multiplayer games. For now, I will go with the variant that targets the player to your right and see how it turns out. If it's too unbalanced, I might add the clause that you return it to the supply to trigger the reaction. Fraud is a lot more political than Contraband. 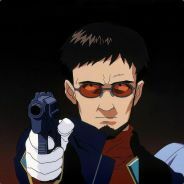 Contraband lets another specific player attempt to hurt you as much as possible, Fraud lets you choose between hurting a specific player or helping yourself. 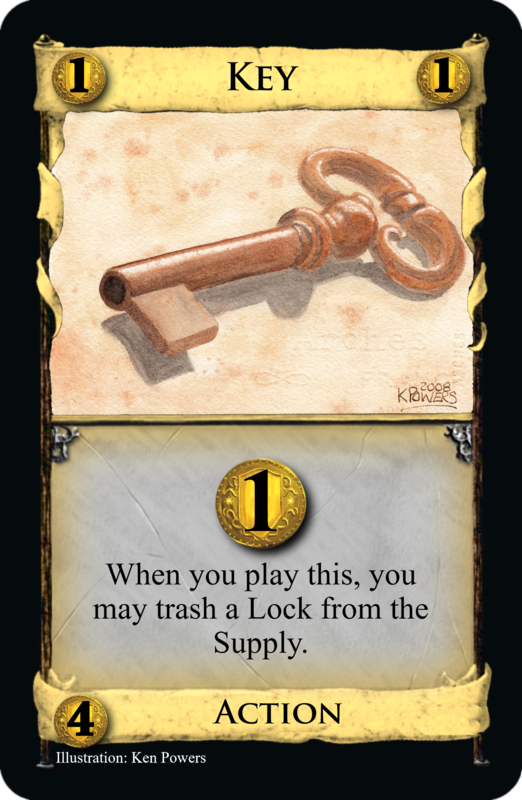 If you're playing for the win, there is never a reason to name politically for Contraband, but there are situations where you have to consider if replacing this specific player's Smithy with a Scout is worth losing Fraud from your hand, and that's political. Furthermore, when you're buying the card, you have to consider if hurting this specific player is important enough to buy a Fraud instead of something that would benefit your own deck more. If you playtest this card, someone could buy it to hurt you just because you, as the designer of the card, have an advantage. 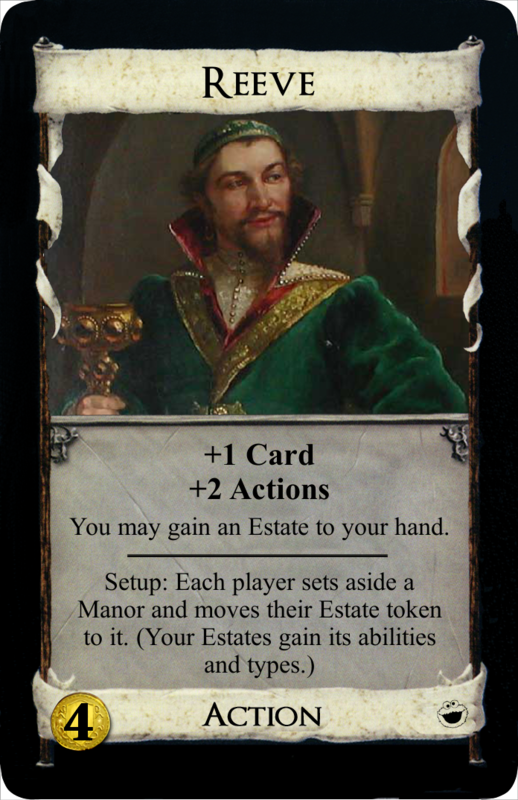 Possession is the only official card that lets a player do that, and it requires other kingdom cards that the victim himself has to buy (edge cases aside) to do any damage, and the damage is usually very minor compared to the other advantages of the card, and hardly ever a reason to buy it. Awaclus, I agree with what you say. There's a lot of considering involved as to how important harming your opponent is. However, I'm willing to go that route, at least for an ample testing phase, and see how the card is received as it is. "When the player to your right would gain a card, you may reveal this Fraud. If you do, set it aside and choose any card with the same cost for them to gain instead. At the beginning of your next turn, put it into your hand." "When another card makes you reveal this Bivouac, you may set it aside. At the beginning of your next turn, put it into your hand or on top of your deck." there should be no confusion with cards that make you reveal cards from your deck until they find something. "When any other player buys a card you may reveal this. If you do choose any card with the same cost for them to gain instead." "When any other player gains a card you may reveal this. 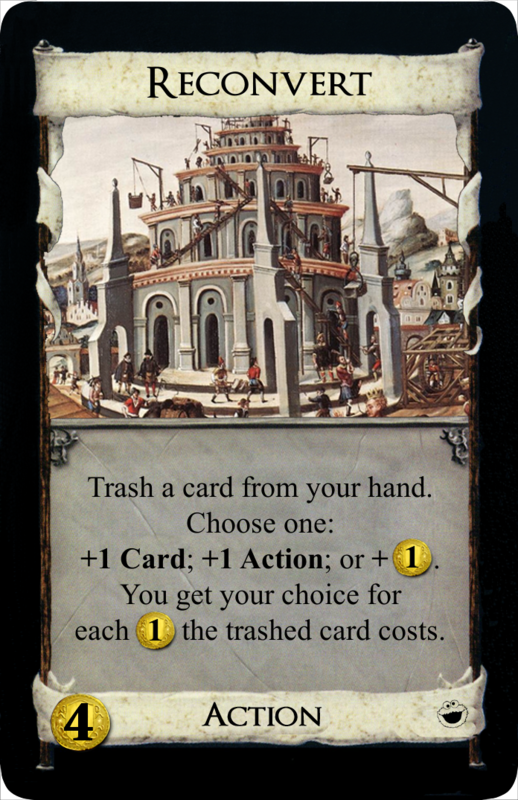 If you do choose any card with the same cost for them to put in their discard pile instead." Of course this still leaves the problem that the reacting would be a bit awkward in a 3-4 player game. Huh? Was this meant for a different thread? Oh yes, you can do so many shenanigans with Fortress. 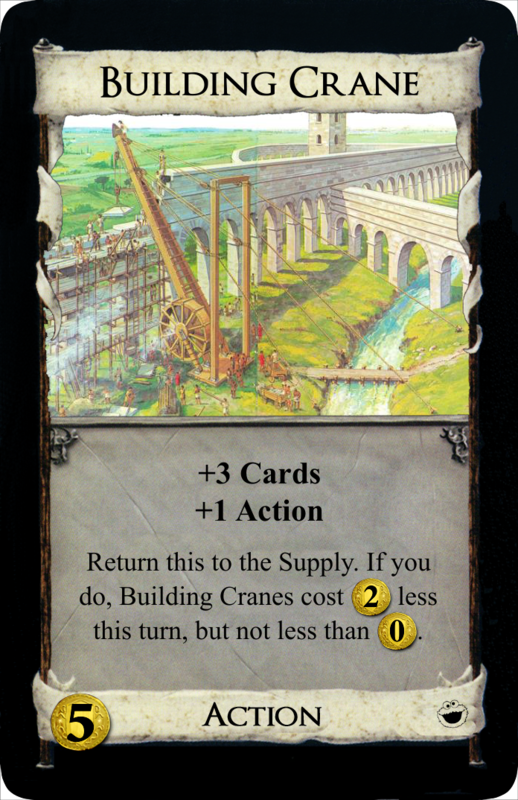 But Building Crane is a one-shot. It probably needs some adjustment but I don't think that its obvious synergy with Fortress is a problem that needs solving. I have eagerly been working on the set since I started this thread and got to play-test a lot with a friend. 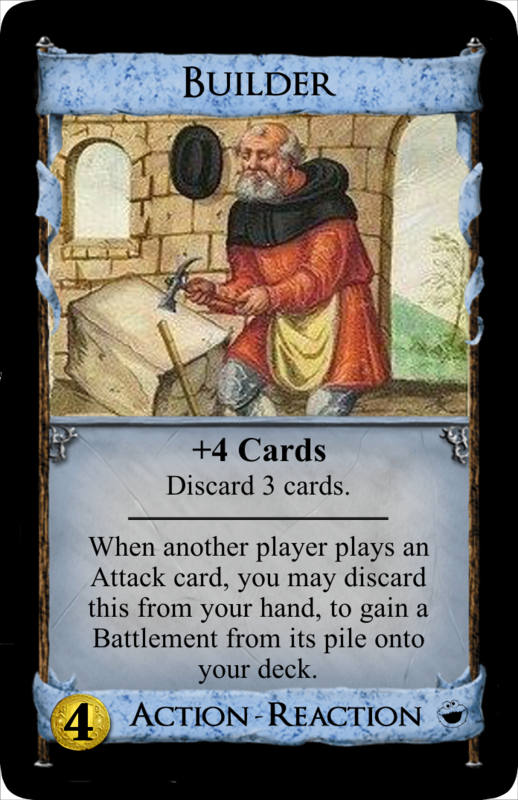 Almost all cards have been reworked several times, some have been cut out, and many have been added. The set now has got the title Roots and Renewal. I have also constantly been updating the set overview in the first post but unfortunately, no one noticed That's why I posted again. I would be very happy if the discussion went on and I can get your opinions on the new cards! Some very cool stuff here. Sorry I haven't critiqued it before. I wish there were text versions of the cards for easier quoting, but I will make do. +1 Card. +2 Actions. Discard a card. When another card makes you reveal this Bivouac, you may set it aside. At the beginning of your next turn, put it into your hand or on top of your deck. So. An on-reveal effect is pretty wonky, but maybe doable. I'm pretty certain it shouldn't be a Reaction card. My rule of thumb here is that the Reaction type is for cards that were not necessarily public knowledge. Usually that means the card was in your hand, but Tunnel is also a Reaction because normally you only reveal the top card when discarding several cards at once. Anyway, on-reveal doesn't need to be a Reaction any more than on-gain or on-trash. Also, I think the option to put this on top of your deck is more words than it's worth. Better to keep the effect simple and I think 95% of the time the player will want to put this in his hand anyway. When you reveal this, you may set it aside. If you do, at the start of your next turn, put it into your hand. +1 Action. Gain 2 Coppers, putting them into your hand. At the beginning of your buy phase, reveal your hand and return all Coppers from your hand to the supply. While this is in play, Copper costs $1 more. Neat effect, but it seems narrow as it is. It would be nice if the card were more generally useful and still had the combos. To this end, I recommend moving the Copper-returning to the start of your Clean-up phase so that you can spend them if you want to. You could even make returning them optional. Returning them is usually the smart thing to do anyway and it saves some "reveal your hand" words. But maybe you want this to combo with Bivouac. +1 Action. Gain 2 Coppers, putting them into your hand. At the start of Clean-up, reveal your hand and return all Coppers from it to the Supply. +1 Card. Trash a card from your hand. Discard any number of Poachers from your hand; +2 Cards per Poacher discarded. Setup: Every player has +1 Buy during turns 1 and 2. Hmm, this feels like it should be nonterminal. Well, whatever. I think the wording could use work. It looks weak? I guess I'd need to test it before I knew how to tweak it. +1 Card. Trash a card from your hand. Discard any number of Poachers. +2 Cards per Poacher you discarded. 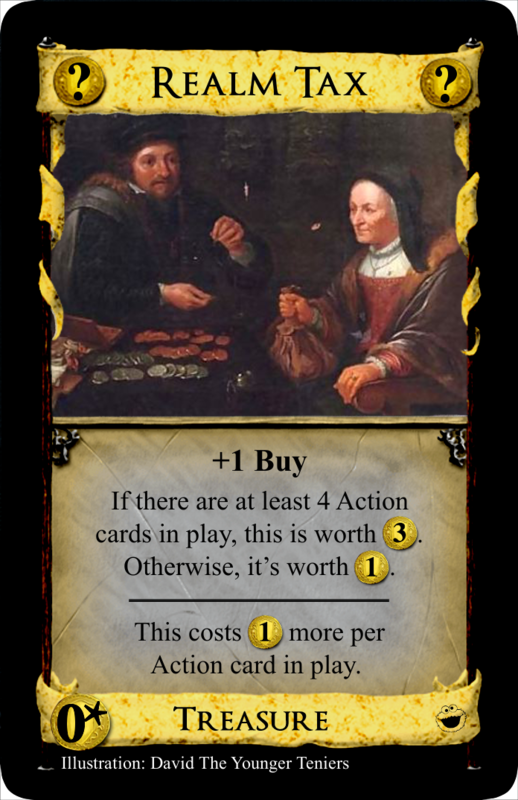 In games using this, each player gets +1 Buy at the start of his first two turns. That's the $2 cards. I'm going to bed soon, but I will try to critique the rest later. Thank you! I appreciate your critique very much. I assume you know what you're talking about. I noticed that it would be easier if there were also text versions of the cards so I'm going to add those within the next days. I can try that out as a non-reaction but I thought you'd need the clarification "When another card makes you reveal this Bivouac" so it is clear that revealing Bivouac upon playing it doesn't count. Maybe I could put "reveal" in quotation marks but that seems awkward. I found it suitable for a Bivouac to be movable flexibly once revealed so it can go into your hand or onto your deck. Maybe that's more text than what it's worth, though. 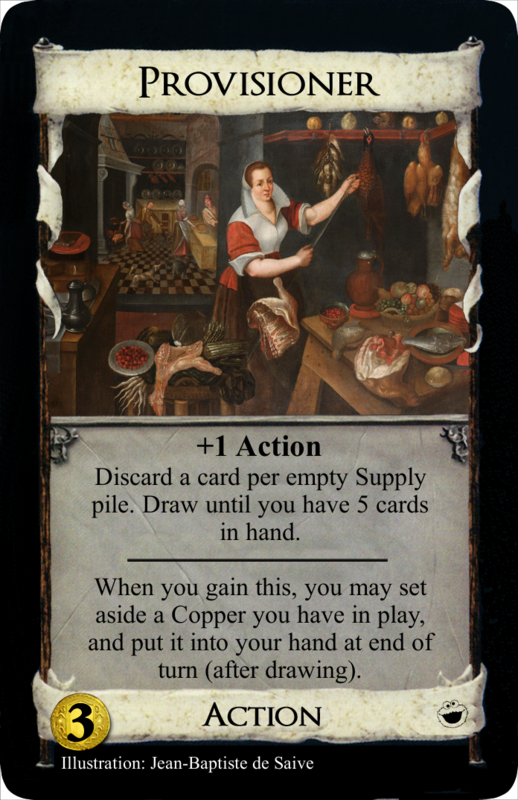 I specifically didn't want the Coppers to be spendable during your buy phase because then Money Launderer would be too good for a $2-card, I think. That's why the returning isn't optional and the "reveal your hand" phrase needs to be there to fix accountability issues. The combo with Bivouac was unintentional. I could try Money Lender the way you suggested but that would play very differently and maybe should be worth $3 then? Now that I've thought about it more, you're right! 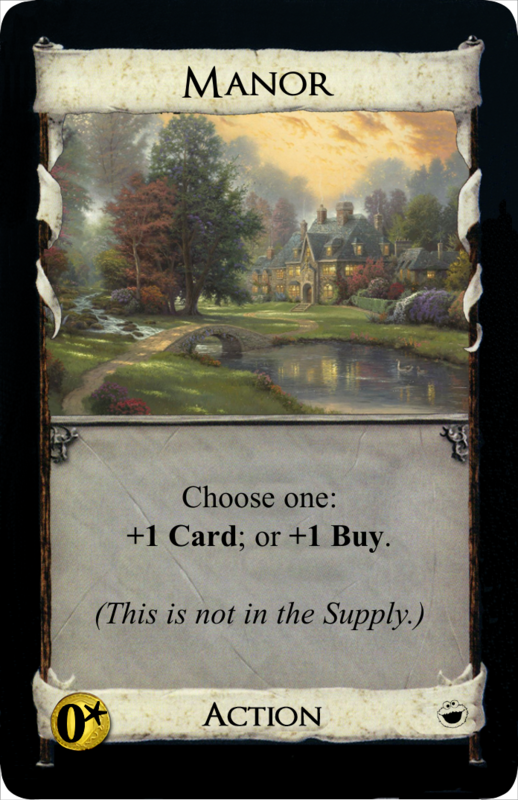 It would be nice if the card had more combos, like with Apothecary and Counting House. It could just say that you can return any number of Coppers from your hand at the start of Clean-up so that if you spent them, you're stuck with them. But wouldn't it be mostly better than Beggar then because it's non-terminal? +1 Action. Gain a Copper, putting it into your hand. At the start of Clean-up, you may return any number of Coppers from your hand to the supply. Poacher could totally be too weak. It's the very latest card I made and basically a placeholder for a card that can be bought multiples of during the opening, that self-synergizes and becomes weaker later. I want to change the wonky setup-line anyway to replace one of your starting Estates/Shelters with a specific Shelter that gives +Buy. I will present that soon. @Money Launderer: I wouldn't worry about a single combo with a card that's not in this set being too OP. Also, Beggar gives you 3 Coppers AND has a Reaction, so I wouldn't worry about comparisons to it. The upshot is I think you should definitely stick with 2 Coppers rather than 1. In general, you seem to be erring on the side of making your cards too weak. I strongly encourage you to err on the side of making them too strong. 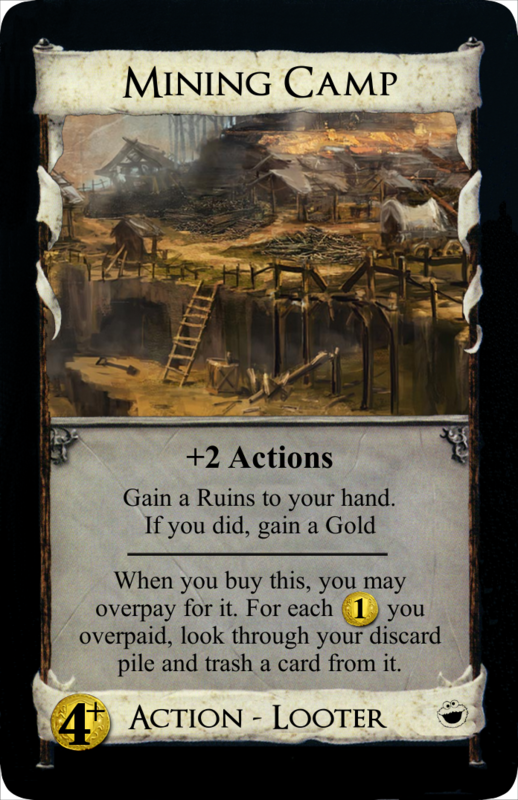 You're probably going to have to tweak them either way, and playtesters tend to buy cards that look powerful way more than ones that look weak. And your cards can probably afford to be stronger across the board.